With virtual conferences, social media and online communities, you can connect with hundreds of other NPs online from the comfort of home. Professional networking is simply the act of meeting others in your field to exchange information and develop relationships. Many of us have been told that networking is one of the most important things we can do to for our career, but why? Networking allows you to create contacts who may know of job openings, volunteer opportunities or other ways for you to get involved and expand your professional skill set. Networking can help you stay informed of changing health care regulations, new recommendations for patients, best practices and other important news that can impact practice, research, education and more. Networking can empower you to join with NPs nationwide to discuss strategies to advocate for patients, the NP role and the health of our country. Networking can be a tool to connect you with other health care professionals, such as nurse midwives, pharmacists, researchers or hospital administrators, to give you a more comprehensive view of the health care landscape and an understanding into how each plays a role in promoting health. One of the most common ways for you to begin networking is through your NP program. Many colleges and universities have alumni groups, which allow you to keep in touch with classmates or connect with other graduates in your community. Many employers also host company mixers or employee events, which can be great opportunities for you to engage with coworkers in different departments or specialties. The next big step you can take is to join a professional association, like AANP. This allows you to branch out of your local network while taking advantage of many other member benefits, such as continuing education (CE) or practice support. Joining committees, either at your worksite or with your association, can help with career advancement and allow you to demonstrate leadership and decision-making skills. Attending conferences not only helps you gain CE or see new products in the exhibit hall—conferences also provide unmatched opportunities to speak with other NPs and develop long-standing friendships. You can have a follow-up discussion about a CE session with an old colleague, give helpful advice to a newly graduated NP or introduce yourself to NPs who share a similar interest or career path. Thanks to the internet, we now are more connected than ever, with even more ways to meet colleagues, discuss health care topics and collaborate with like-minded professionals. Following health care-related organizations—such as AANP—or thought leaders in health care on social media is a great way to connect with industry professionals, stay current with the latest news and share your work with the health care community. Joining online communities, such as LinkedIn Groups or AANP’s Specialty Practice Groups, can allow you to engage beyond simply “likes” or “follows.” These offer a forum for members to collaborate, discuss and share tools and resources around any number of topics, specialties, therapeutic areas or professional interests. Virtual conferences give you the same chance as a traditional in-person conference to learn, chat with exhibitors, meet other NPs and gain tools for your practice, and there's no need for travel, housing expenses or excessive time constraints. These events have features specifically designed to give virtual attendees the opportunity to engage with presenters and achieve educational outcomes comparable to an on-site conference. 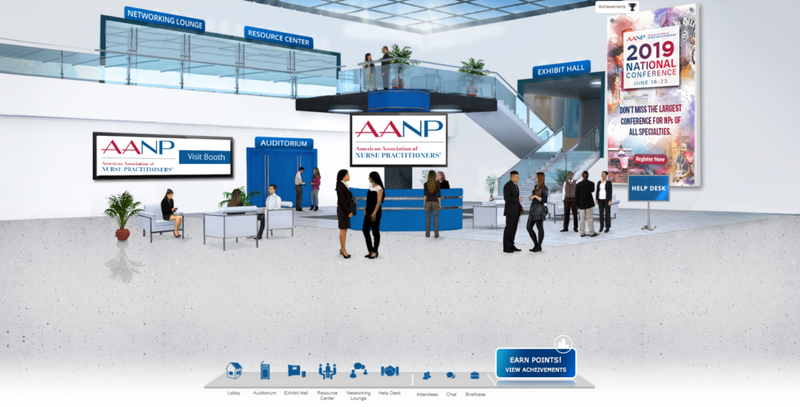 In addition to six live educational sessions, the AANP Live: 2019 Diabetes Virtual Conference includes an online Networking Lounge for you to participate in a public group discussion with your fellow conference attendees and the ability to search for and chat with an individual attendee. Register by 5 p.m. CT on March 22 to participate and earn up to six hours of CE credit, which includes 3.92 pharmacology*. Are you registered? See how to take advantage of this exciting virtual networking opportunity!